Pork Kare – kare is a classic Filipino dish. It is usually made of pork or beef meat. However it can also be made using seafoods ingredient, that is if you have the budget or you have a very special occassion. The meat is stewed for several hours until tender and then peanut butter is added to give its distinct peanut sauce. Lastly, achuete seeds is added to give it its yellow to yellow -orange sauce. This dish is always accompanied with bagoong alamang or fermented shrimp paste, so no salt is added to this dish. 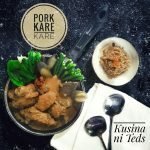 My mom requested for a pork kare – kare for our lunch and I decided to cook it and incorporate some techniques. I grilled the pork in the oven until the fat turned crispy instead of simmering the meat. I scraped of the charred parts after grilling and then wash it thoroughly before simmering. When grilling the pork in the oven it will release its natural fat and juice. Reserve this and add it into the broth later since this contains some of the flavor of the pork. You can prefer not to do this method since it’s time consuming, right? 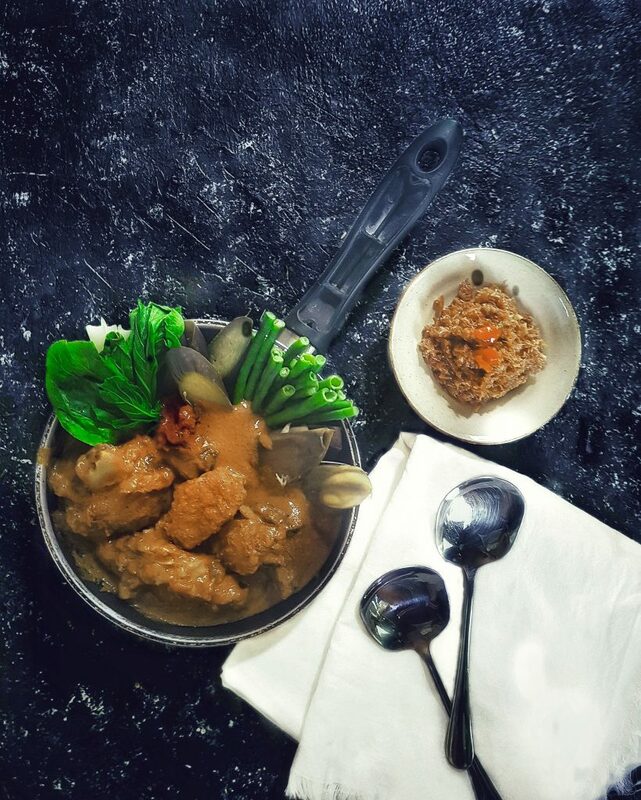 However if you want your pork kare – kare to have a smoky flavor you can try it out. Oh! Did I said smoky? Yes. You can grill the pork in hot charcoal until the fat is crispy. This will really give you a smoky flavor. I patterned this method of preparing the pork in my Grilled Pork Monggo with Banana Blossom recipe. Next, instead of mixing all the vegetables into the sauce, I decided to separately cook the vegetables in a boiling water. I cooked the vegetables one at a time and dipped it in tap water to stop the cooking process. Then, I get a cup of the vegetable stock and added it into the broth. By doing so, we can incorporate the vegetable flavor into the sauce without adding the vegetable into it. So why separate the vegetable from the sauce? This will avoid us from eating soggy vegetables and only use the vegetables that we will eat for lunch. Yeah! We are still going to eat it for dinner so I kept the rest of the vegetables for dinner. We can avoid the kare – kare from spoiling if we separate the meat and vegetables from the sauce. However feel free to add the vegetables into the sauce if you are going to consume it right away. Thoroughly clean the pork. Pat dry and drizzle with olive oil. Season the pork with salt and pepper. Bake for 40 minutes in a preheated oven at 240 degrees Celsius. Scrape of charred parts of the then wash thoroughly. Reserved the pork fat and juice for the stew. Add the pork, pork fat and juice, water, bouillon cubes and black pepper and then simmer until the pork is tender. Pour in the peanut butter and stir until well incorporated. Add the vegetable stock. Premix the glutinous rice flour and water then add into the main dish and stir until the broth becomes thick. Premix the achuete seed and hot water. Let it steep for 30 minutes before straining and then add the liquid into the sauce and simmer for another 5 minutes. Boil together the water and salt, and then add the yard long beans. Then simmer until cook. Remove the yard long beans and place in a cold water and drain. Set aside. Do the same for the eggplants, banana heart and bok choy. Reserve 1 cup of the vegetable stock. To prepare the bagoong alamang, saute the garlic, onion and tomatoes in olive oil. Season with ground black pepper. Add chili, white vinegar and sugar and cover. Do not stir. Let the water of the vinegar evaporate before stirring. Start with a half cup of vinegar before adding a quarter cup of it. Taste if it’s to your liking. Combine the pork, vegetables and sauce. Serve with bagoong alamang. Kare – kare is a Filipino dish. It is usually made with pork or beef meat stewed in peanut sauce. It is always accompanied with bagoong alamang as a dipping sauce. Bake for 40 minutes in a preheated oven at 240 degrees Celsius. Remove the meat and scrape of charred parts then wash thoroughly. Reserved the pork fat and juice for the stew. Add the pork, pork fat and juice, water, bouillon cubes and black pepper. boil and simmer until the pork is tender. Add the peanut butter and stir until well incorporated. Add the vegetable stock. Premix the glutinous rice flour and water. Add into the main dish and stir until the broth becomes thick. Premix the achuete seed and hot water. Let it steep for 30 minutes. Strain and add the liquid into the sauce. Simmer for another 5 minutes. Boil together the water and salt. Add the yard long beans and simmer until cook. Remove the yard long beans and place in a cold water and drain. Set aside. Do the same for the eggplants, banana heart and bok choy. Reserve 1 cup of the vegetable stock. Add chili, white vinegar and sugar. Cover and do not stir. let the water of the vinegar evaporate before stirring. I suggest to start with a half cup of vinegar before adding a quarter cup of it. Taste if it’s to your liking.